I'm always trying to come up with tasty ways to incorporate spinach and other dark greens into my little guy's diet. Last night I decided to boil baby spinach with garlic and then puree it with olive oil and Parmesan cheese to make a "pesto" like sauce for my son's pasta. It ended up being a really delicious sauce, and my son loved it! You can also add legumes or chicken to this dish to add protein. My little guy had chicken for lunch so I didn't add it to his dinner. You can puree this dish for babies 8+ months, or serve as finger food for older babies. Bring a medium pot of water to boil. Add pasta and peas and cook for 5-8 minutes. Once the pasta and peas are cooked use a large slotted spoon to scoop out the pasta and peas (you are going to boil spinach in the pasta water so do not drain the pasta, just scoop it out with the spoon. I know it sounds odd, but it will give the spinach a little more flavor.) Set the pasta and peas aside. Add the baby spinach to the boiling pasta water. Add minced garlic and cook for about 3-5 minutes. Drain spinach, and puree it with 2 tblsp olive oil and parmesan cheese. Pour the spinach sauce over pasta and peas. Toss to coat the pasta. Serve your little one about 1 cup of the pasta, and store the rest in the fridge or freezer. Enjoy! This one is great! I love that you incorporate more complex flavors into the food. You may also like http://homemadebabyfood.net/index.html. 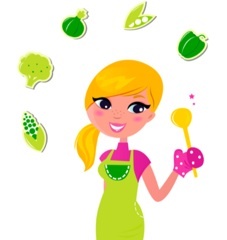 There are tons of recipes in there for little ones. Thanks! I love your blog. At the point when triplets are headed, you have to arrange three times the infant shower! An awesome approach to commend the entry of triplets is with a three peas in a pod shower. This charming child shower subject has turned out to be entirely well known, and there are not just loads of fun items out there to buy, additionally some incredible thoughts for the DIYer. 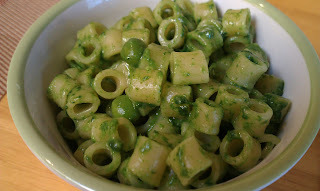 Olive Pesto Pasta is a simple, economical meal for under 10 dollars. It is healthy and contains many fat busting ingredients.For the more information sourkitchen.